Fake Plastic Tunes: LISTEN: Lost Daft Punk Track - "Drive"
As part of a compilation for the 20th Anniversary of Soma Records, the electronic label is planning to release a previously unheard Daft Punk song entitled "Drive," recorded in 1994 during the early days of Guy-Manuel de Homem-Christo and Thomas Bangalter's collaboration as Daft Punk. 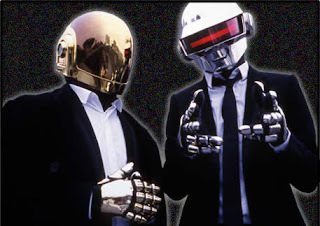 The track foreshadows the duo's later work on 1997's Homework and is wrought with the energetic electronic buzz that has characterized much of Daft Punk's catalog. Check out "Drive," streaming below and cross your fingers (but don't hold your breath) for a new Daft Punk record in the near future.